Who Is Kwaku Ohene-Frempong ? ONE OF GHANA'S FAVORITES AND PHILLY'S OWN? A true story that every Ghanaian should read and be proud of Philadelphia, PA, USA --There are many Ghanaian brothers and sisters worldwide who have achieved a great deal of success and continue to give back to their community. They have become role models for the old and young. In an era where entertainers and athletes have become the role models for many young and old, one person continues to make a big difference in the Ghanaian community, in the medical world, in the sports world among all races, black, yellow and white. He has also become a symbol of Ghanaian/American success stories. He is humble, well travelled, well respected, always smiling, and he fits well in any gathering regardless of age or group. KWAKU OHENE-FREMPONG, MD needs no further introduction. To me as a publisher by profession, if the achievements of this wonderful gentleman were to be published in a hardback format, it would take 25 writers, 10 proofreaders, 10 editors, a whole pool of production crew and other features to put this book together. In summary, this great man has achieved immensely and as a result, he deserves the recognition and the spotlight. His success story should also serves as a model for all Ghanaians. 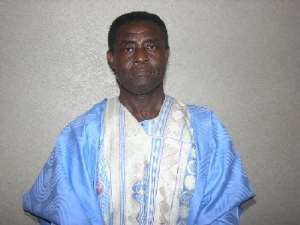 Born in Kukurantumi, Ghana, Kwaku Ohene-Frempong, M.D., came to the United States in 1966 to attend Yale University. Prior to coming to Yale, Kwaku Ohene-Frempong, this International Scholar Athlete Hall of Famer, Amanfoo alumnus, described by Ivyleaguesports.com as “Renaissance Man”, had served as the Senior Prefect of Prempeh College where he had done both his “Ordinary” and “Advanced” level secondary school studies. It was also at Prempeh where he began his athletic career, won three national track championships and became Ghana national high school champion in long jump, triple jump, and high hurdles. At Yale, he captained the Track and Field team and set both indoor and outdoor records in the high hurdles. While at Yale, he continued to compete for Ghana and in 1970 set a new Ghana record in the 110m high hurdles. This record stood for 26 years and was broken at the 1996 Atlanta Olympic Games. He received his Bachelor of Science degree in Biology in 1970 together with the William Mallory Award for the Best Student Athlete at Yale. He went on to Yale School of Medicine from where he graduated in 1975. His doctoral thesis, entitled “Child Health in a Ghanaian Community” was based on work he did at Komfo Anokye Teaching Hospital (Kumasi) in 1974. After graduation from Yale, he moved on to New York City for a residency in Pediatrics at the New York Hospital – Cornell Medical Center. In 1977, he came to The Children's Hospital of Philadelphia for a three-year fellowship in Pediatric Hematology-Oncology. Upon completion of this subspecialty training, Dr. Ohene-Frempong went to Tulane University where he established the Sickle Cell Center of Southern Louisiana and served as its first Medical Director. He also became the Director of the Section of Pediatric Hematology-Oncology and Associate Professor of Pediatrics at Tulane University School of Medicine. Dr. Ohene-Frempong returned to The Children's Hospital of Philadelphia in 1986, becoming the Director of the Sickle Cell Program under the Division of Hematology. In 1988, this Division won a grant from the National Institutes of Health to become one of the nation's ten Comprehensive Sickle Cell Centers. Dr. Ohene-Frempong was named the Center's Director in 1990. The Center grant was successfully renewed for 1993-1998, 1998-2003, and again for 2003-2008. Dr. Ohene-Frempong directs the Center's pediatric hematologists, nurse specialists, social workers, child psychologists and counselors in the care of more than 600 children and adolescents who have sickle cell disease. In addition to coordinating this patient care, Dr. Ohene-Frempong oversees the research activities of the Center and conducts research projects. Dr. Ohene-Frempong is presently testing new treatments for children with sickle cell disease. He has also developed a project for testing newborns for sickle cell disease in Ghana. Dr. Ohene-Frempong served as a member of the Sickle Cell Disease Advisory Committee of the National Institutes of Health (1986-1990), and chaired the Committee his final two years. In 1991, he was elected President of the Sickle Cell Disease Association of America; a position that was later renamed the Chief Medical Officer. He completed his 2-term office in 1998. He continues to serve as a member of the national Board of Directors of the Sickle Cell Disease Association of America and was elected as Chairman of the Board in September 2003. The National Collegiate Athletic Association (NCAA) gave Dr. Ohene-Frempong the Silver Anniversary Award in 1975, an award that recognizes six distinguished former student-athletes on their 25th anniversary as college graduates. In 1999, he was named an inaugural inductee into the International Scholar Athlete Hall of Fame together with Arthur Ashe, Senator Bill Bradley, Justice Byron White, Paul Robeson, Plato, and others. And in November 2001, as part of Yale University's 300th Anniversary Celebration, Dr. Ohene-Frempong was selected as one of nine former athletes of Yale selected as inaugural recipients of the William H. W. Bush Lifetime of Leadership Award. Currently, Dr. Ohene-Frempong is a full-time member of the faculty of the University of Pennsylvania School of Medicine where he is Professor of Pediatrics. He is Board certified in Pediatrics and Pediatric Hematology-Oncology and is an Attending Hematologist at The Children's Hospital of Philadelphia. In 1993, National Heart, Lung, and Blood Institute of the National Institutes of Health awarded Dr. Ohene-Frempong a research grant to develop a pilot project for Newborn Screening for Sickle Cell Disease in Ghana. The first such screening program in Africa, this international collaborative project was established in Kumasi and Tikrom, a nearby rural town. Participating institutions include The Children's Hospital of Philadelphia, Noguchi Memorial Institute for Medical Research, the School of Medical Sciences, Kwame Nkrumah University of Science and Technology, Komfo Anokye Teaching Hospital, and the Ministry of Health, Ghana. Prior to initiation of the screening program, the first sickle cell clinic was inaugurated at Komfo Anokye Teaching Hospital with 10 patients in December 1992. As of December 2003, the project had tested over 158,000 newborn babies in the Kumasi area, and enrolled over 2,400 newborns with sickle cell disease in the clinic. Overall, the sickle cell clinic had grown to more than 8,000 patients by September 2003. One Ghanaian, one father, one role model, one Hall of Famer, is taking sickle cell research to a whole new level and as a result deserves Ghanaweb's spotlight. Ghana is proud to have Dr. Ohene-Frempong as one of its favourite sons and Philly is “damn” proud to be the home of this great man. Dr. Ohene-Frempong, Mr. CNN of Ghanaweb says “more grease to your elbow” “Waye adee papa, ohene, mede nyame dawo ase se wate ghanafoo anim”. Dr. Ohene-Frempong and his wife, Janet, live in Elkins Park, PA. They have two children, Kwame (31) and Afia (26).